Commemorating the Sesquicentennial of the Maryland Natural Resources Police, the oldest statewide law enforcement agency in Maryland and the fourth oldest conservation law enforcement agency in the country. It traces its origins to the Maryland Oyster Police Force, founded in 1868 with the appointment of its first commander, Hunter Davidson. Fighting naturalist…not a common characterization to be sure, but history presents several military figures that have made significant contributions to natural science. Two of the more familiar are British Royal Navy Captain James Cook’s discoveries throughout the Pacific Ocean and the voyages of Captain John Smith, an early 17th century explorer with an impressive military resume famous for documenting the Chesapeake Bay. In the United States, President Thomas Jefferson sent Captain Meriwether Lewis and Second Lieutenant William Clark, both Army officers, to explore the interior of the North American continent hopeful of finding an inland water route to the Pacific Ocean. They had additional instructions to record and retrieve samples of new species of plant and animal life. The U.S. Exploration Expedition, led by Navy Lieutenant Charles Wilkes, traveled throughout the South Pacific between 1838 and 1842 and brought back artifacts that became among the first to be displayed as part of the Smithsonian collection in Washington, D.C. Courage, experience in logistics and organization, along with a calmness under pressure and knack for the ability to triumph through adversity are qualities that served them well as military officers. Equally important to their successes as naturalists were their desire to further the collective body of scientific knowledge and a personal pride in efforts to record, preserve, and even enhance the natural world through which they traveled. One such man was Hunter Davidson. His legacy is part of the lore of the Maryland Department of Natural Resources as he became the first Commander of the State Oyster Police Force, forerunner of today’s Maryland Natural Resources Police. Unquestionably a warfighter first, and a prominent one at that, his efforts have had a long-lasting impact on natural resource conservation beyond what he might have personally imagined. Born in Georgetown in 1826, Davidson earned his sea legs in the pre-Civil War Navy of the United States. He was an 1847 graduate of the fledgling Naval Academy at Annapolis and was present for operations aboard USS PORTSMOUTH during the War with Mexico. Subsequently he spent time in the 1850s assigned to USS DALE interdicting the slave trade off the African coast. Davidson cast his lot with the Confederacy. Rather than a seagoing career characterized by fleet engagements in battleships upon the oceans, his circumstances with the Confederate Navy dictated a different path. His wartime service focused on riverine operations for an under resourced and overmatched Confederate Navy, one whose tactics were characterized by the mining of waterways, technological innovation, harassment incidents and commerce-raiding. Among his earliest assignments as a Confederate Naval Officer was aboard CSS VIRGINIA, formerly the USS MERRIMACK, as a gunnery officer during the Battle of Hampton Roads in March 1862. He participated in the world’s first ever clash between ironclads during an encounter against the USS MONITOR. This was the most famous maritime engagement of the Civil War and an important milestone during a time of transition from the age of sail with “wooden ships and iron men” to an age of steam powered vessels with armored plate, precision weapons and exploding shells. Davidson later claimed several direct hits on USS MINNESOTA, causing her to run aground. Partially due to Davidson’s expert gunnery and leadership during this battle in March 1862, VIRGINIA handed the U.S. Navy the most devastating losses it would realize until the Japanese attacked Pearl Harbor in December 1941. As part of his work with explosives, Davidson’s team developed an effective spar torpedo, essentially a contact bomb at the end of a pole, which he quickly decided to test in battle against MINNESOTA, at that time berthed downriver at Newport News. 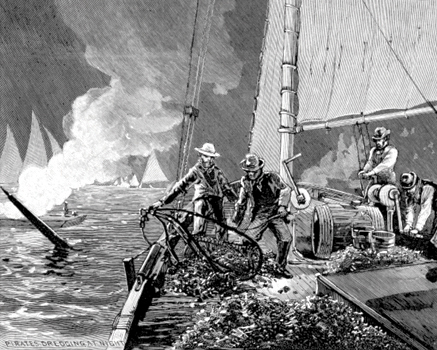 With a small crew of daring men, he stealthily maneuvered the steam launch SQUIB among the enemy fleet at night, locating the flagship and successfully detonating the spar torpedo causing significant, but not fatal, damage. This incident represented the first successful use of offensive torpedoes during the war without a simultaneous loss of the attacking party…lucky for Davidson! Davidson’s most impactful effort during the Civil War was in his role as Commander of the Confederate Submarine Battery Service, perfecting and operationalizing the concepts and work he started with his mentor, Maury, on the electric detonation of mines. As a direct route to the Confederate capital of Richmond, Virginia, the James River was a strategic military prize. In May 1864, the Union began a coordinated plan to capture Richmond with the North Atlantic Blockading Squadron sent up the James River with supplies and logistics support for land forces under the command of General Benjamin Franklin Butler. Mindful of intelligence reporting the presence of underwater mines, the North’s forces were carefully preceded by mine-sweeping gunboats and troops searching the river banks for telltale wires and the necessary galvanic battery. Perfectly timing a detonation as the USS COMMODORE JONES passed directly over a mine, the vessel was completely destroyed by the explosion. Having taken place in full view of the North’s fleet, the threat of additional losses deterred them from further advancement up the river. The subsequent attack on Drury’s Bluff near Richmond by Butler’s forces was repulsed, most probably due to the fleet’s inability to provide support. In an account published after the war in “Confederate Veteran” magazine, Davidson claimed that Secretary of the Navy Mallory wrote him after this incident and stated “I always considered your torpedo division as equal to any division in our Army.” High praise indeed! In the early 1850s before the Civil War, Davidson was assigned duty for several years with the Coast Survey, a predecessor of what became the National Oceanic and Atmospheric Administration. The U.S. Navy had a close relationship with the Coast Survey during this time with federal law requiring survey vessels to be crewed by Navy personnel when available. The purpose of the survey was to use scientific methods to chart the coastal areas of the country, making them safe for navigation and commerce. The data discerned and analyzed by the Coast Survey was vital, not only for commerce, but also for an understanding of conditions, including habitat, necessary to the work and interests of a naturalist. Davidson no doubt found the knowledge gained from his years of survey work useful during his tenure commanding the Submarine Battery Service for the Confederacy. However, it was after the war, when his disloyalty to the Union disqualified him from further military service to the nation that he used this knowledge to great advantage. A perfect opportunity presented itself in the state of Maryland. For centuries, Chesapeake Bay oysters were harvested for local consumption. By the mid-1800s, harvested oysters could be canned for shipment to distant markets. Transportation networks and railways improved as cities matured, the growing taste for oysters seemed insatiable, and oysters found ready markets throughout the country. At first, the supply seemed as limitless as the demand, but that situation soon changed. Maryland passed laws restricting harvest, New England watermen traveled to the Chesapeake as their own beds were depleted, the water boundary between Virginia and Maryland was in dispute, and local law enforcement of state restrictions was minimal to poor. As a result, in 1868 Maryland created the State Oyster Police Force and Hunter Davidson was selected its first commander. This period is known as the Oyster Wars. 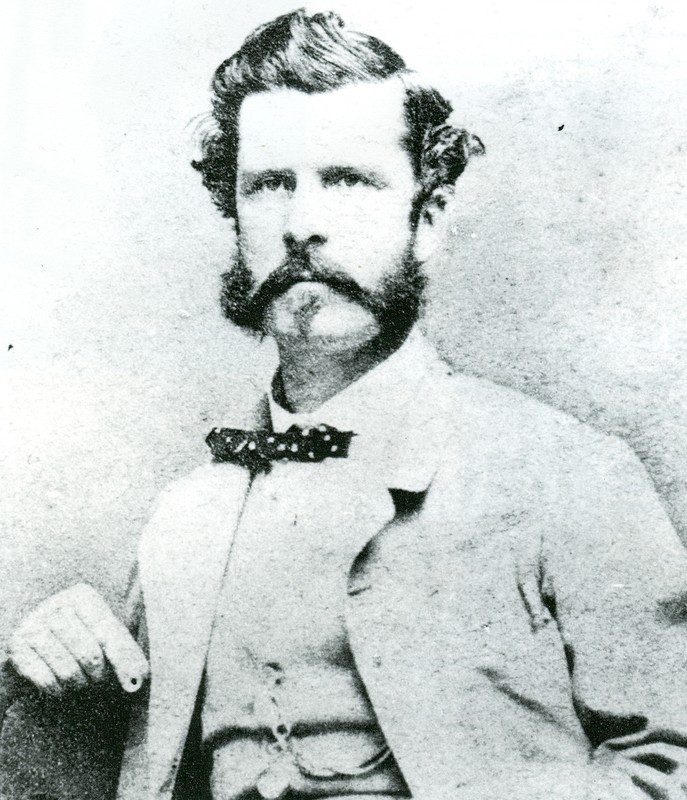 Aside from the inroads Davidson made for Chesapeake Bay conservation law enforcement, he used his experience with the Coast Survey, analytical ability, and growing knowledge of the industry to author a report to the Maryland General Assembly in 1870 making recommendations regarding oyster management issues that are astoundingly similar to the issues debated –though not so violently – today. His observations are astute for someone not trained as a scientist, though his recommendations take a strong anti-commercial industry tact perhaps due, at least partially, to the resistance met by his enforcement measures amongst oystermen. He felt the oyster population depleted to the point he advocated for a three-year gear restriction moratorium on dredging (without a corresponding reduction of tonging) to remove harvest pressure in deep water areas and allow enough time for the existing spat set to grow to market size. For enforcement reasons, he also recommended no dredging be allowed at night. Further, he advocated for a time of year restriction on dredging to shorten the season to Sept. 1 through May 31, to allow more opportunity for reproduction success. Keenly aware of a lack of resources necessary for adequate enforcement and understanding the profit margins then existing in each segment of the oyster supply chain, he proposed an increase of license fees for harvesters as well as a new carrying tax per bushel on “All persons engaged in packing, pickling, or opening Oysters for sale or transportation…” Insightfully, he also suggested the licensing and fee structure be identical to those imposed by Virginia so as not to exasperate the competition already felt between the two jurisdictions. Davidson foresaw the tremendous opportunity for oyster aquaculture, pointing out the ideal environmental conditions and the sustainable nature of the endeavor. Davidson quit state service in 1872 as a result of his Oyster Police Force being used too often as a source of patronage for unqualified friends of politicians. For someone so mission-oriented and having made significant strides toward his goals, decisions that weakened the effectiveness of his command proved to be more than he could stand. For the remainder of his professional career, he furthered both his warfighter credentials and naturalist reputation in South America. He founded the Argentine Navy’s Torpedo Division and then, once again –using the skills obtained during his formative years – performed the first detailed hydrographic surveys of Argentine waters including the Bahia Blanca Estuary and the Iguazu River and Falls. Davidson died in Paraguay in 1913 at the age of 86. The CSS Virginia, Sink Before Surrender, John V. Quarstein, The History Press, Charleston, SC, 2012. Officers Serve In Three Navies Within U.S., Richard P. Cox, The Washington Times, Dec. 3, 2004. Letter From Lieutenant Davidson, C.S. Navy to Lieutenant Jones, C.S. Navy of Oct. 25, 1862 Regarding the Engagement in Hampton Roads, VA.
Secretary Belton wrote this special feature to accompany the Natural Resources Police’s 150th Anniversary timeline found in Vol. 21, No. 2 of the Maryland Natural Resource magazine, spring 2018.